The Neoclassical period of the 18th and 19th Centuries inspired leading architects, furniture makers and ceramicists such as Robert and James Adams, James Stuart, Thomas Chippendale, John Linnell and Josiah Wedgewood to design stunningly functional gilded objects to adorn the beautiful interiors of the great Georgian houses of Britain. Executed superbly by notable sculptors, designers, modellers and metalworker, these exquisitely crafted and often overlooked antique gilt metal and giltwood pieces are luxurious artworks, commissioned by affluent patrons and collectors. 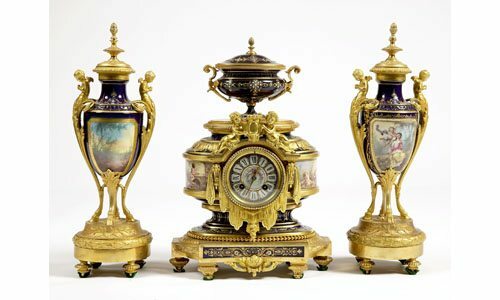 Gilt metal and giltwood was utilised to create and embellish functional pieces such as clocks, candelabras, mirrors, porcelain and highly refined furniture. These gilded pieces dually provided another reflective surface in which to refract candlelight whilst also adding a luxurious refinement to the opulent homes of great and wealthy 18th and 19th Century patrons and aristocrats. Neoclassicism emerged in Britain and France in the 1750’s, the movement sought to create a ‘true’ style which could be reflected within all disciplines of the visual arts, creating a singular unifying momentum which drew from past civilisations and would inform civilisations to come. Inspired by the fashionable custom of visiting Europe, primarily France and Italy on a ‘Grand Tour’ the privileged classes searched for art, culture and the roots of Western Civilisation. Many architects and designers drew inspiration for their designs from the discoveries of the Graeco-Roman domestic architecture at Pompeii, Tivoli and Herculaneum. The Grand Tour brought ancient civilisations to life, it was accessible only to the privileged classes due to the laborious and costly nature of travel during this period. The expeditions inspired and shaped many scientists, architects, designers, antiquaries and patrons of the arts, giving definite form to Northern Europeans’ concept of the classical Greco-Roman world, informing Neoclassical ideals. The Ascension of the young and accomplished George III to the British throne in 1760 heralded a new era for art and design in Britain. King George III, an active patron of the arts and sciences, implemented upon his accession an immediate policy of significant and cultural patronage. It was during this period that Neoclassicism would thrive and give rise to some of the finest chasing and gilding workshops responsible for some of the finest artworks of the era. Extremely expensive and adroitly wrought these artworks demonstrate the prominency of skilled craftsmanship achieved during the 18th and 19th Centuries. The ultimate symbols of the classic ancient world, urns, vases, sphinxes, vine leaves, swags and festoons of hanging garlands of fabric, ribbons and flowers were used as motifs on pottery, mirrors, candelabra and clock garnitures. A vast array of living and figmental animals such as dolphins, lions, sphinxes and satyrs also appear on Neo-classical objects often forming the bases or handles of the pieces whilst decorative beading, originally a motif of Classical architecture was used to decorate smaller objects. The process involved the creation of a two dimensional design, often designed by a notable architect or sculptor, a three dimensional design would then be created, cast and chased with chasing tools. The model then underwent gilding using the mercury gilding technique before being applied with a paste of ground gold and mercury. The fusing of the gold could entail the object being passed through a flame, sometimes as many as several times in order to create the desired lustre. It was a dangerous, lengthy and costly procedure, the exquisite precious objects created are a lasting testament to the skills of the gilding craftsmen. 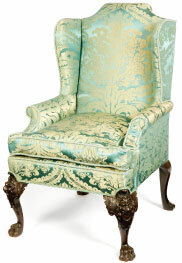 The reinterpretation of these classical features and the skilled addition of gilt metal, giltwood and ormolu decoration enabled high society to combine grandeur with elegance simultaneously and unquestionably are a unique addition to contemporary interiors today.